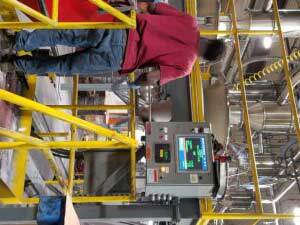 Sterling Systems & Controls, Inc. provides many types of batching systems. A popular type of batching system in many industries, but most especially in the food and related foodstuffs industries is the Semi-Automatic Batching System, a.k.a the Kitchen System. The semi-automatic batching system uses similar automation technology, both hardware and software, as the automatic batching systems. However, the semi-automatic batching system requires an operator to be present throughout the entire batching process to perform functions as detailed in the instructions provided by the semi-automatic system. The primary role of the operator in a semi-automatic batching or kitchen system is to manually feed ingredient material into the batching collection container on the weigh scale of the system. The batching system will provide instructions read by the operator on the touchscreen display of the system. For example, the system will instruct the operator to place ingredient #1 in the batching container and will tell the operator the amount as well. The batching system will require the operator to enter an ingredient code manually or using the optional barcode scanner. Until the correct code is entered, the system will not allow weighing of the ingredient. Once the system confirms that the correct ingredient is being selected by the operator then the system instructs the operator to weigh “X” amount. The operator simply begins scooping the correct material into the batching container and the system automatically weighs the ingredient. The system has a tolerance for each weighment. When the weighment is within tolerance the system then instruct the operator that the weight is okay and the operator can confirm and move forward with the next instruction. The semi-automatic batching system always knows where it is in the process of creating the batch, so if the operator is interrupted the system knows exactly where it was when the interruption occurred. The semi-automatic batching system uses the automatic interlock approach to ensure the batch is valid and for purposes of lot tracking if ever required. This eliminates bad batches due to operator error and interruption. Each semi-automatic batching system, or kitchen batching system, is customized to include the maximum number of bins required by the customer’s specific formulas. And the bin size can vary depending on the weighment size per ingredient required for each batch. Two size bins are often utilized. The larger bin has a nominal capacity of 2.75ft3 and includes rugged casters for ease of movement in/out from underneath the batching system tables. The small bin size has a nominal capacity of approximately 0.84ft3 of bulk solid material and sits on the table top. The bins are manufactured of food grade material, have clear lids and integrated material scoops. 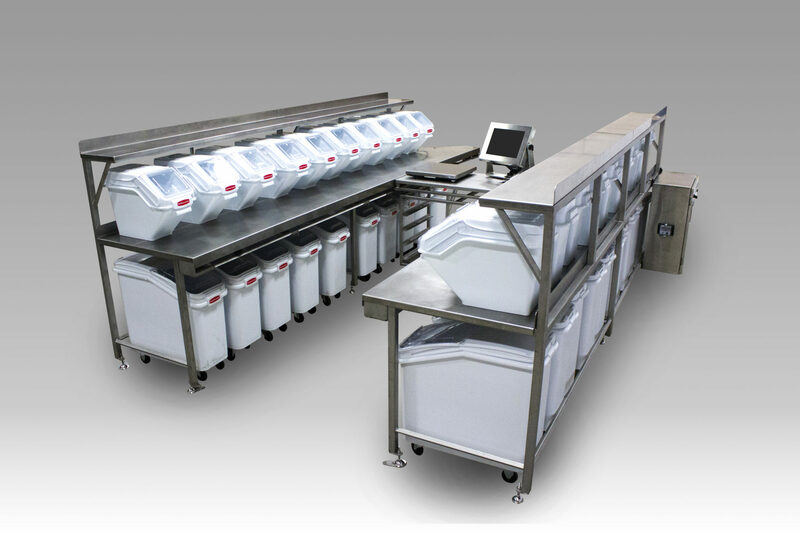 The semi-automatic batching system tables are sized to fit with the number of ingredient bins, and for operator comfort. The quantity of tables depends upon the number of bins required in the system. The tables are manufactured of stainless steel material, typically grade 304 for food grade compatibility. The ingredient tables are of rugged construction and are designed to be stationary. The scale platform table is also constructed of 304 stainless steel. However, unlike the ingredient tables the scale platform table is not fixed. It is designed to smoothly travel between the two ingredient tables. The operator simply moves the scale platform table as needed to reach the next ingredient bin that is required. The scale platform table is attached to the ingredient tables by a roller system. The scale and the operator interface touchscreen are mounted to the top of the scale platform table. The cabling from the scale and touchscreen display is mounted within a flexible cable carrier and is routed between the scale platform table and an adjacent ingredient table. Semi-Auto Hand Add Station Operator Interface as part of large automatic / semi-auto hybrid batching system for compounding plastics. We know electrical controls and automation technology and can customize a system for our customers using standard control and automation components. For the semi automatic batching systems we have used a PC (control panel mounted) and an industrial touchscreen monitor (scale platform table mounted). The control panel encloses the PC and other components to allow for its operation and interface with the monitor and scale. A weight indicator is also included mounted in the front door of the enclosure. A barcode scanner can also be provided for operation with the lot tracking part of the control system to assure batch validation.